Everyone wants to win at slot machines but not everyone knows how to do that properly. That is why the skilled players write books. We are to read them and make our own conclusions on the best strategies which should be used during the game. 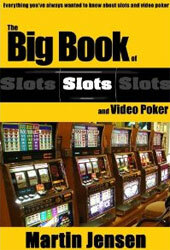 One of the chapters is devoted to different slots types. They indicate the manufacturer, the game format (it can be a reel spinner, modified multiplier, bonus video, progressive or anything else), number of reels, paylines. The denominations and maximum bets and the top payouts are mentioned. And also average hit frequency is noted. If there are different quantities of the paylines, the top frequencies alter. And another interesting moment is included; it is a long-term payback range, expressed in percentage. And the author gives some extra information on the game and the best options to play it. Jensen also gives the hourly cost of playing a slot machine. That is absolutely wonderful. A person knows that an hour play at a Nickel machine with 2 coins will cost him or her $5 and so on. The rate is given for the Nickel, Quarter and Dollar machine for playing 2, 3 or 5 coins. And the payback rate is 90 percent. What concerns the high jackpot machine, the author advices to avoid them. The jackpots are huge but at the same time there are millions of the combinations and we would spend more on that machine. But playing at a machine, which does not have the largest jackpot in the casino, can be rewarding as we would receive some payback anyway. John Patrick's Slots claim the same idea. Just like other writers, among whom MacIntyre Symms, Victor H. Royer and John Patrick, Jensen says that there are loose and tight machines. They are scattered around the casino and the loose ones attract the visitors and the players are constantly winning. The others hear the coins falling all the time and they want to win too but next to the loose machine the tight ones are located. The author reminds not to leave the machine before pushing the Cash Out button. Even if you hit jackpot, there are still some credits you won. The machine is to convert them into coins. If you do not press that button, someone else will. And it is really good to take all your winnings with you.